It’s said ‘the exception proves the rule’ let’s see how this plays out. The trilemma, also known as the “impossible trinity” is a fundamental thesis of international economics. I’ve covered in detail previously, so this is a short overview. It was developed by economists Robert Mundell and Marcus Fleming in the early 1960s. In its simplest form, the Mundell-Fleming model says that a country cannot have an open capital account, a fixed exchange rate, and an independent monetary policy at the same time. It can have any two out of three, but not all three. A country that attempts to have all three will fail in one of several ways including a reserve crisis, an exchange rate crisis or a recession. Despite the warnings that the model provides, China is attempting to pursue the impossible trinity. At the Daily Reckoning we’ve covered these Chinese dynamics on our extensively, reporting on the geopolitics at play in China, the global dollar shortage and the indicators of a Chinese collapse. China wants a fixed exchange rate to the dollar, in part to satisfy the Trump administration that it is not a currency manipulator. And China wants an independent monetary policy not tied to the Federal Reserve policy rate, in part to stimulate the economy and keep insolvent SOEs afloat. As predicted by the Mundell-Fleming model, China’s attempt at the impossible trinity was failing badly in 2015 and 2016. The prospect of currency maxi-devaluation by China made local savers try to get their money out of China. The open capital account made that capital flight possible. Between late 2014 and late 2016, China lost over $1 trillion of its original $4 trillion in reserves. At the rate China was losing reserves, about $50 billion per month, it would have run out of liquidity by late 2017. Clearly this could not be allowed to happen, so China took policy steps to address the dynamics of the trilemma. China maintained its peg to the dollar for political reasons, but it gave up on the other two legs of the trinity. China took rigorous steps to partially close its capital account except for government approved transfers. Next, China raised interest rates to stay in alignment with Fed tightening and make it more attractive for Chinese investors to keep their money in China. Instead of abandoning one leg of the trinity, China took half measures on two legs, a classic Chinese finesse. So far, these tactics appear to be working. Capital outflows have slowed down and China’s reserve position has stabilized at around $3 trillion. The charts below show how Chinese interest rates have risen sharply in 2017 to align with Fed tightening, surrendering China’s independent monetary policy. 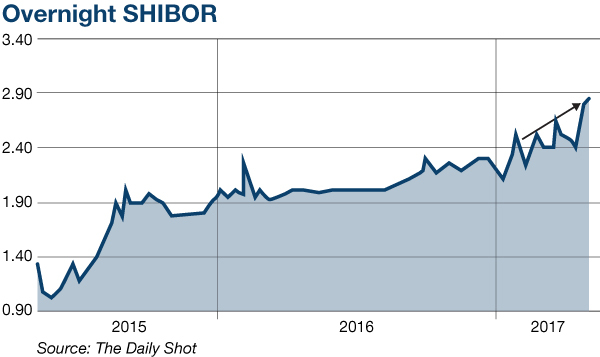 Both 10-year government bond yields (top) and the overnight Shanghai Interbank Offered Rate, SHIBOR (bottom) have risen steeply this year. The problem for China is that these measures are temporary. A closed capital account will discourage new foreign investment in China because investors will have no assurance that they can repatriate profits or sales proceeds in future. Higher interest rates will ultimately bankrupt State-owned enterprises (SOEs) and lead to higher unemployment and slower growth. For the time being, China seems determined to maintain its exchange rate peg to the dollar. The yuan has traded in a tight range of 6.95 to 6.84 to the dollar since shortly after the election of Donald Trump. It was at 6.89 on May 19, about in the middle of that narrow range. 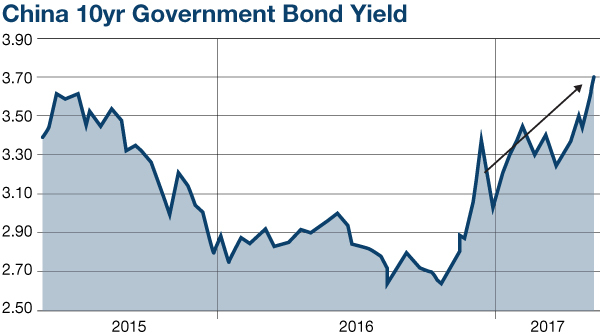 In time, the capital account will have to be reopened and interest rates will be eased. Under the unforgiving logic of the trilemma, this means that either China will have to devalue the yuan or see its reserves evaporate. Clearly the reserves will not be depleted, therefore a devaluation is coming. But, when? The answer is not before 2018.